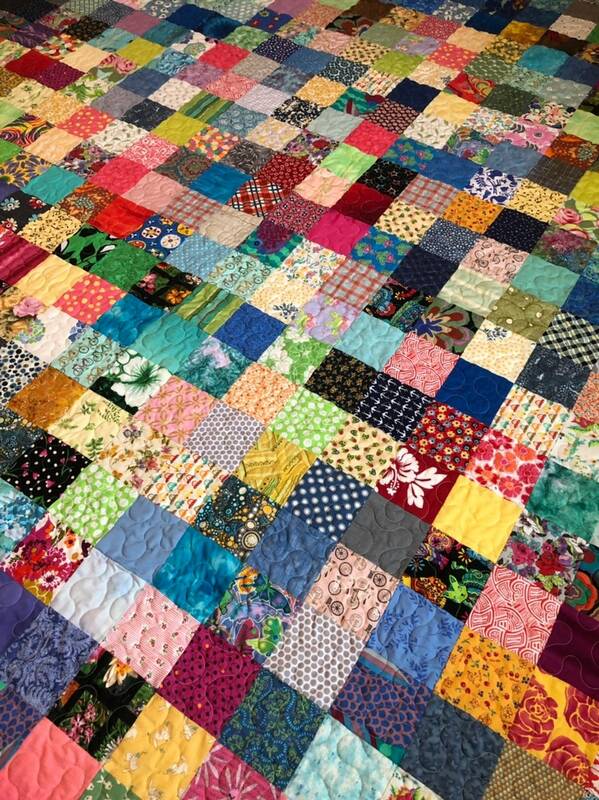 Colorful patchwork quilt made of 4 inch squares. The fabric is all new and 100% quilting cottons. Quilt measures 96" X94"-a very generous queen size. The backing fabric is a quilting cotton beige print with white flowers. The quilt is quilted in an all over meander pattern. The batting is cotton/polyester blend. The binding is a light green and has been machine attached for durability. Quilts are made to be washed and used! They are machine washable on the gentle cycle and tumble dry. Thank you for visiting QuiltsModern where traditional quilts are made the modern way! This is the first quilt made for 2019 and we named it Amanda! Also this is my favorite block in the quilt-bicycles!